The 2017 New York International Auto Show promises to be a good one for those looking forward to 2018 Toyota models. Even though Phoenix is a long way away, we’re still watching with plenty of interest. Not only will many of the 2017 models available now at Bell Road Toyota be on display, but two new models — the 2018 Toyota Sienna and 2018 Toyota Yaris — will take a bow as well. 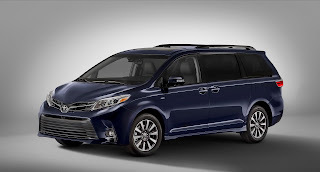 The 2018 Toyota Sienna comes with a refreshed sense of style. Already boasting a five-star NHTSA safety rating for 2017, the 2018 model promises to be even safer thanks to the TSS-P version of Toyota Safety Sense. That means pedestrian detection, dynamic radar cruise control, lane departure alert with steering assist, automatic high beams, pre-collision system. Many other new tech features are also on offer. One of our favorites is the upgraded Toyota Entune 3.0 infotainment system, featuring App Suite Connect, navigation, and some nifty optional features (like WiFi Connect). Upgrades are available on the higher trims, allowing drivers to add a premium JBL Audio sound system. At the other end of the size spectrum, the subcompact 2018 Toyota Yaris also gets an update. Already good-looking, it gets an updated front fascia on both the three-door L and LE trims, and the five-door SE trim. The SE also gets 16-inch alloy wheels, and dark accents on the wheels and grille. Multiple upgrades await inside, with different trims getting upgrades to the steering wheel, instrument panel, and audio systems. Entune finally comes to the Toyota Yaris, with the SE receiving Entune Audio Plus and the Connected Navigation application. 2017 — the calendar year, and the model year — have been good to us at Bell Road Toyota, but 2018 is shaping up to be even better still. The new Toyota models above won’t arrive for a little while yet. But if you have questions, or would like to browse our inventory of new and used Toyota vehicles, stop by our showroom at 2020 West Bell Road in Phoenix, AZ today!